Continuing from last weeks feature on Crystal Palace, there is so much more to the sim that I first realised, I felt it warranted a further details. Rezzing in outside the barn in Meridas, to the East, following the path takes you past a steeple course, which I have been told, allows multiple ponies to run at the same time. This is as far as I know, unique in SL. Following the path in a north easterly direction takes you to an old western themed area known as Shanatown. 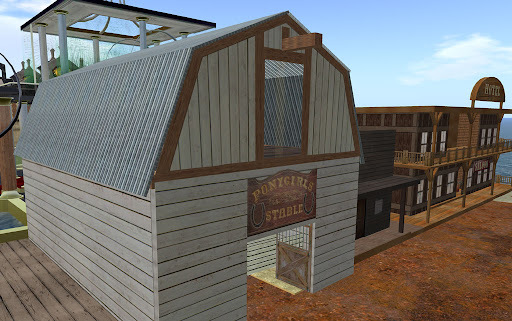 Complete with its own saloon and stable area for ponygirls, the saloon includes a nice area to dance with your loved ones, while remaining in touch with the pony play aspect. Ambling in a Northerly direction past Shanatown, takes you past a building I haven't discovered the purpose of and into Harlech royal Hall, where there is another pony steeple course laid out. Continuing north past the steeple, there are some small boats in the water, in case you feel like taking a different mode of transport. Passing the boats still bearing North takes you past the Great Hall proper, which has dance balls available for those romantic nights dancing. Still going north takes you into Meriland, and into Vanessa's castle - and yes, the first thing I saw here was another pony steeple. No pony can get bored here. Around the perimeter of the steeple is a pony trap (cart) race track, which allows for multiple racers at the same time, and the start is in the north eastern corner from the steeple. To the west of the steeple is Harlech Castle, named after a real castle in Wales. 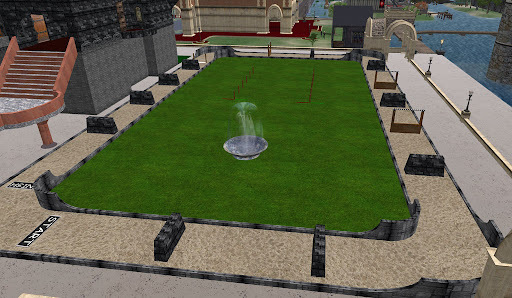 The courtyard of the SL castle again caters to ponies, with a set of Royal pony stalls, as well as a place to practise archery SL style. Still further exploration in the area wher the cart race starts will see a yacht club - something that when added to everything else here, offers something for almost everyone, pony or otherwise. Lots to keep just about anyone amused for ages, and definitely somewhere I would recommend visiting. And I hear that there is also an airport, car race track and more to find still.